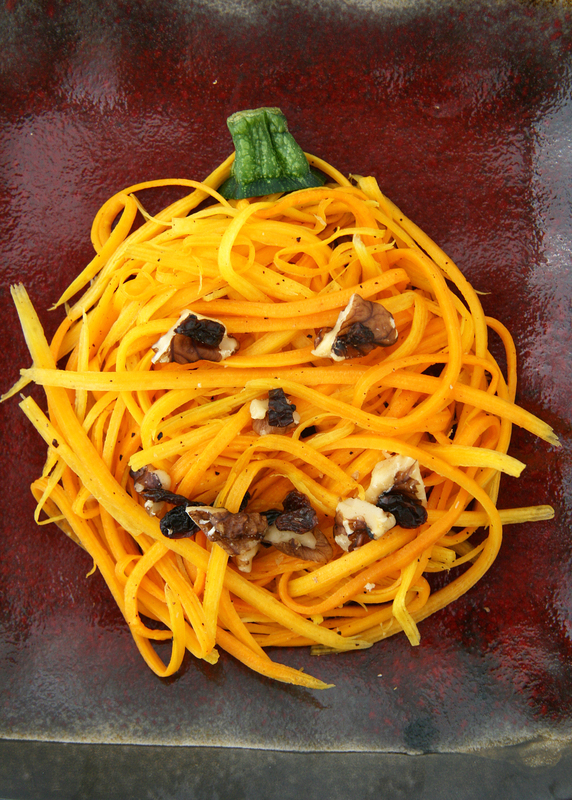 Shredded “Pumpkin” Butternut Squash Salad for Halloween! Side note: Halloween reminds my of my mom. She LOVES Halloween – from decorating her graveyard in the front yard (it’s amazing, I need to find a photo), to throwing parties, dressing up and making fun food. 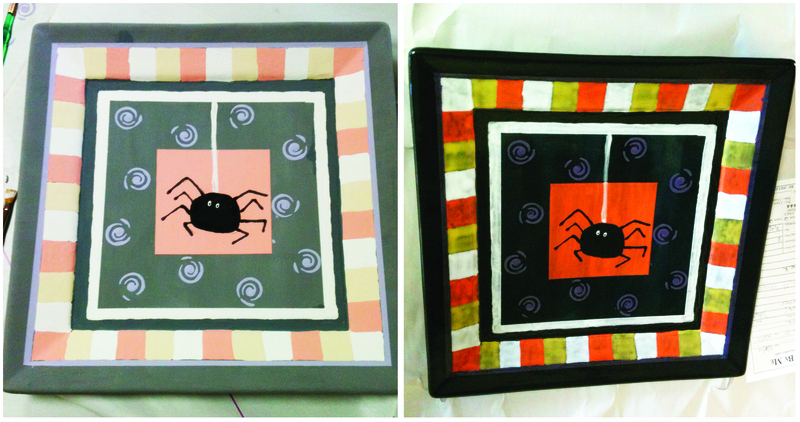 She loves this holiday so much that I painted her a large Halloween serving platter for her birthday…which is in March (no where near October 31st). No lie. No worries, that’s a friendly spider! He justs wants a little nibble of whatever you are serving and he won’t bite 🙂 Maybe he will want a taste of my shredded butternut squash salad? It’s definitely festive! Cara over at her Fork and Beans blog has been posting adorable Halloween food ideas and she inspired me to jump on the Halloween-food bandwagon! Go check out her fun posts to see all the goodies she’s come up with 🙂 I admire her writing and her story, we just met via blogging and I already love her. 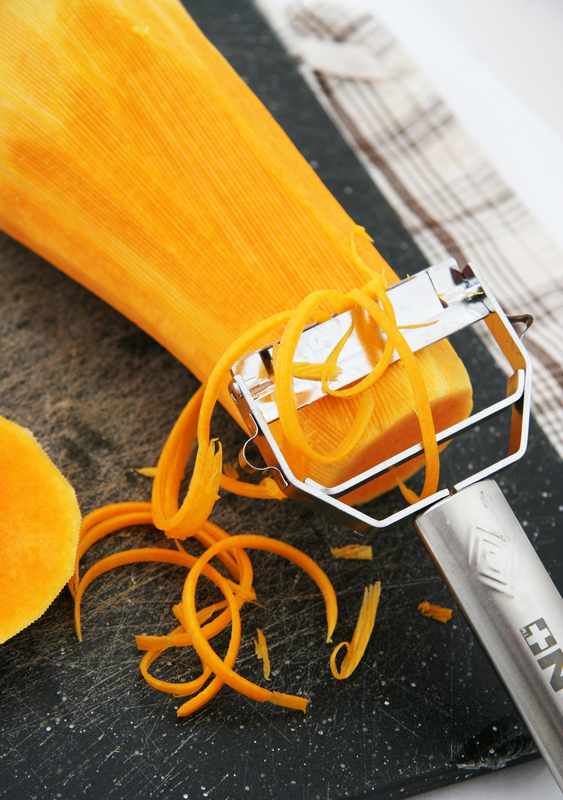 I used the Titan tools from Bed Bath and Beyond to quickly peel and shred my butternut squash (well worth the $15!!) but you could grate the squash, use a mandoline with a shredder or use a food processor with a shredding plate to cut down on prep time. It didn’t take me long at all to pull this dish together so the kitchen tools came in handy for this recipe! 1. 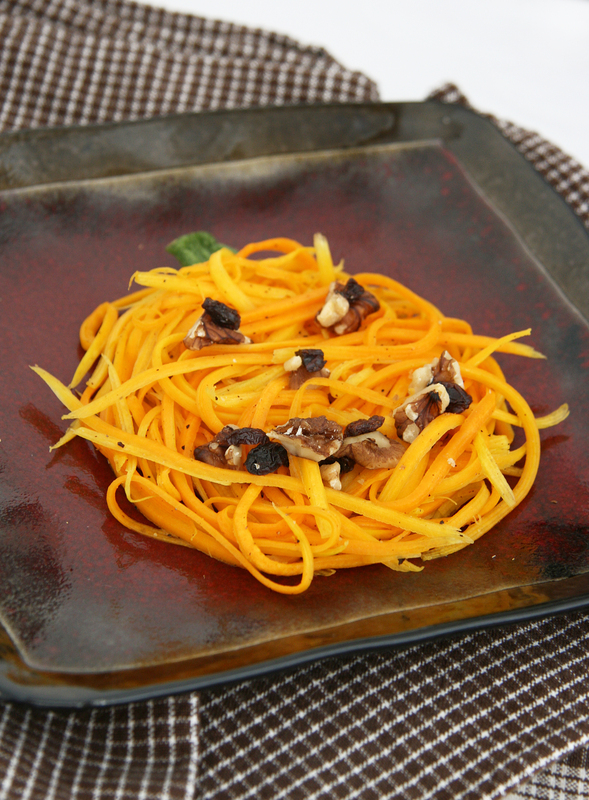 Add shredded butternut squash, apple cider vinegar and olive oil to a microwave-safe bowl. Cover and cook for 75-90 seconds until slightly tender (or more if you prefer a more cooked squash). 2. Add honey, salt and pepper and toss to combine. 3. Take approximately one cup of mixture and form into a circle on a plate. 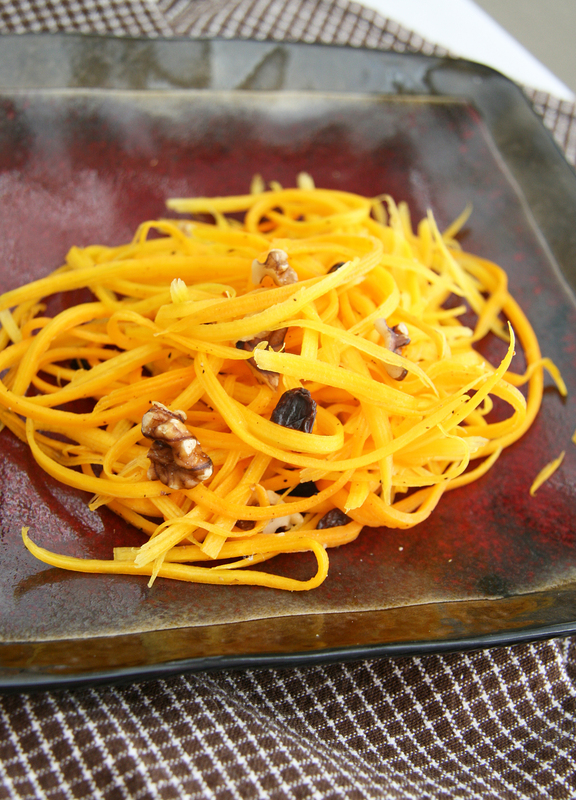 Place stem of zucchini on the top middle for a “pumpkin stem” and add walnuts and raisins in the shape of eyes, nose and mouth or just toss nuts and dried fruit with squash in a bowl and enjoy! (except for the inedible zucchini stem). 1. Fill a pot with one to two inches of water. Bring to a boil. Place shredded squash in steamer basket or colander and sprinkle with salt. Place basket or colander in pot and cover. Allow to steam for about 2 minutes, until slightly tender (or cook more but make sure it’s not too limp). 2. Transfer shredded squash to a mixing bowl. Add apple cider vinegar, olive oil, honey, salt and pepper and toss to combine. This recipe is featured at Recipe Lion’s Halloween Blog Hop post and Ricki’s Wellness Weekend at Diet Dessert and Dogs. Awww thanks for your kind words! I do enjoy art in all forms – I should make more time to draw and paint, so fun! That plate that you made is just plain adorable! And that is coming from a girl who literally despises spiders and anything remotely close to maybe wanting to look like a spider. Hate them. But your plate? ADORABLE! I never ever thought that a spider could be cute, and I especially never thought that I would be saying that about a spider. Bet your mom was super happy with her present. What a great idea to shape the salad into a pumpkin. That would be such a huge success with kids, no doubt about it! Thanks so much Sonia! 🙂 I am terrified of spiders too…after too many episodes of insane bites etc, I can’t stand those little guys in person! Cute. 🙂 I love pumpkin things! And I am not much for cutesy food, but I know a few little ones who would love something like this! You are SO cute 🙂 I love that you commented twice, what a sweetheart! Thank you!